ZYK678 R Hertz, Franca, SP was surprisingly phading up over R Pampa, Porto Alegre, RS on February 22 during LEM354. A short FB message conmfirmed my reception. 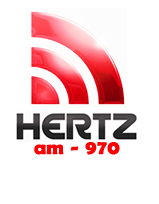 Rádio Hertz, according to the station, is considered as the third oldest in the interior of Brazil, the tenth to be installed in the country and the second oldest in the state of São Paulo. As far as I know, the station has npot been heard in the Nordic countries prior to my logging last February.